His closest opponent Soumaila Cisse won 17 percent of the vote. They will meet in a runoff vote later this month. Keita was hopeful to win a second term. The 73-year-old, who was elected in 2013, faced 23 candidates in the first round. Keita's main challenger was 68-year-old Cisse, his rival in 2013 elections, has vocally criticized the president for not addressing Mali's rising insecurity during the election campaign. The first round of elections, held Sunday, was affected by several incidents of militant violence and dozens of closed or burned polling stations. 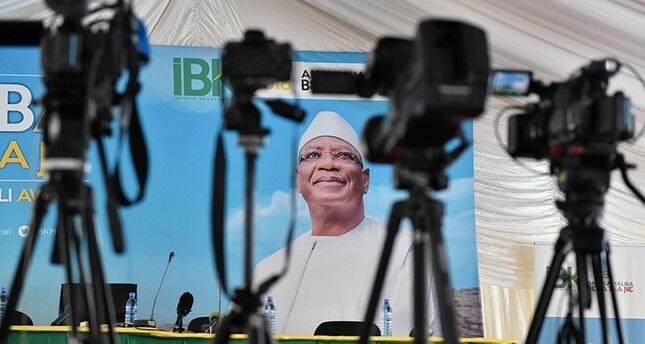 Following the election, major opposition figures, including Cisse, signed a joint declaration stating: "We will not accept results marred by irregularities." The disgruntled candidates lashed out at alleged corruption, vote buying, and ballot stuffing during voting. Cisse's team had warned of possible election fraud ahead of the poll, claiming that there were two electoral lists and hundreds of fake polling stations. Not a single ballot was cast at 716 polling stations in Sunday's first-round vote in the volatile central region of Mopti and some parts of the north following threats and attacks by armed groups. There were mounting calls for the government to publish a list of polling stations where the election could not be held due to violence -- a request voiced by European observers on Tuesday and echoed by opposition candidates. There were a total of 23,000 polling stations nationwide.